-I was asked not too long ago if I wanted to a cameo role in his comedy film “Barely Coping” (MAD ANGEL FILMS). Starring Ryan Santiago and Jennifer Lefsyk. I believe most of it was filmed last year. It was shot before, but I was told it didn’t come out right upon review and he wanted to redo the entire scene as more of a spoof on a popular origin story. 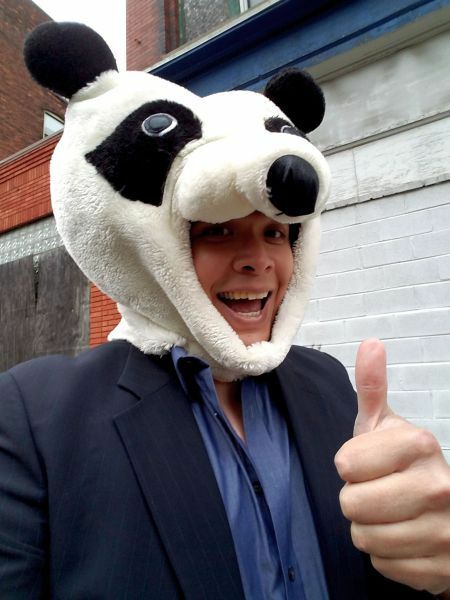 I said sure-it’s not every day one gets to wear a panda head (although I didn’t find out that was part of it all till a day or two before the shoot). It was fun and went by relatively quick. The scene was mostly with friends I’d acted with before. I got to do a scene with Joseph “Little Wayne” (HA!) for the first time (since it’s been going around since “Radiant Dark” that he could play my son or a way younger version of me) so that was cool. Check out the pics -I’m glad I got them off my phone before it died. I believe “Barely Coping” is to be released before years end. Check out the MAF pages for news and updates. Pics can be seen on my acting page on Facebook. This entry was posted in ACTING, FILMS and tagged acting, Barely Coping, comedy, facebook, Jennifer Lefsyk, Joseph, mad angel films, matthew a peters, Panda, Radiant Dark, Ryan Santiago, wayne w johnson, WWJ. Bookmark the permalink.